Download the executive summary or the entire research memo. One of the most vexing issues facing the content industries is their loss of control over the distribution of digital material. Combined with the ability of consumers and fans to organize and voice opinions more loudly than ever before, many industries, including recording, broadcast, and motion picture, find themselves acting from defensive postures, seeking to shut down grassroots activities and file sharing. In contrast, some in the industry, particularly (though not exclusively) independent artists, have embraced this unfettered flow of materials and discourse. This C3 research memo (1) briefly identifies the current situation of information and content flow and the kinds of steps being taken to combat it. Against this backdrop, it then (2) identifies the reasons one might choose to embrace these changes rather than fighting them (3) argues that these industries need to consider the role of social exchange in addition to the economic exchange models they are used to in building consumers' willingness to pay for content they can obtain for free and (4) proposes specific strategies for building social exchange relationships in this environment. In what follows, I use music as an exemplar, but the discussion will not be limited to music. The music industry is a microcosm of mass communication's past and a harbinger or its future (Benkler, 2006; Briggs & Burke, 2009). Once local and interpersonal, inherently relational, and shared with co-present others, the phonograph and the recording industry it spawned enabled music to become a centralized mass-produced commodity. It was less than one hundred years ago that music became an object to be created at great expense, widely distributed and purchased at a set price, rather than an experience to be shared (Benkler, 2006). The music industry, like most media industries, is built on a highly centralized model that relies on tight control of distribution and, to a lesser extent, communication. Four firms (Universal Music Group, Sony Music Entertainment, Warner Music Group, EMI) are responsible for 72% of the global music market (Wikstrom, 2009). a. The more persecuted file sharing becomes, the further underground and harder to track this behavior will be. b. The flow of materials provides critical real time information about where and in some cases by whom, they are being taken up and used, which can be of great use in better planning campaigns, tours, targeting marketing, etc. Thus one sees companies such as Big Champagne, which the RIAA has been paying to track file sharing for years, as well as newer start ups like Band Metrics that assess the flow of downloads and buzz about bands as it happens. The model driving the music industry for decades has been one of economic exchange in which the musicians and industry provide a scarce good (records or CDs) for which the audience pays money, providing artists with their primary revenue stream. Secondary revenue streams included live performance and, perhaps the most important marker of the audience's affect, merchandise such as t-shirts and posters. The ubiquity of file sharing means that the once scarce good of the music itself has become an infinite good, freely available to those with the minimal competence and disregard for intellectual property required to download. The question of why audiences might still pay for music has become critical for the very survival of music as the industry it has become. In economic exchange, a fixed good is exchanged for a fixed price according to legal rules of exchange. While there are and will always be elements of economic exchange in the relationship between content industries and their audiences, increasingly the building of social relationships is important in providing incentives for audiences to contribute financially. In social exchange relationships, the rate of exchange is motivated by feelings of trust, obligation and gratitude rather than price structures. Social media provide new means for producers and artists to connect with audiences in ways that allow them to build relationships, yet few have moved past viewing audiences as consumers to understand and interact with them as relational partners. This section lays out the dynamics of economic vs. social exchange (drawing on Blau's early formulation) and argues that this model elucidates the ways people can provide rewards including money, but also services and the ephemeral but important motivations of affection, and validation. There are many concrete ways in which content industries -- and brands more generally -- can make use of this flow of materials, discourse and exchange, and the research memo will conclude with some suggestions, illustrated with examples such as Amanda Palmer and Trent Reznor. Benkler, Y. (2006). The Wealth of Networks: How Social Production Transforms Markets and Freedom. New Haven and London: Yale. Briggs, A. & Burke, P. (2009). A Social History of the Media (Third Edition). Malden, MA: Polity. Wikstrom, P. (2009 The music industry: Music in the cloud. Cambridge, UK: Polity. 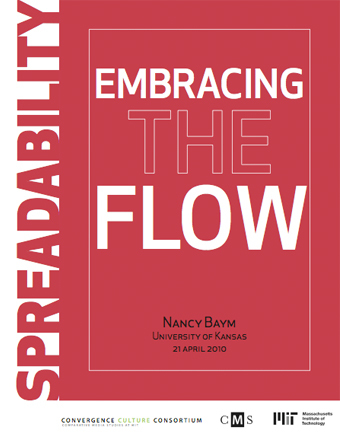 Nancy Baym is an Associate Professor of Communication Studies at the University of Kansas, where she teaches about communication technology, interpersonal communication and qualitative research methods. She pioneered the study of online community and fandom in the early 1990s, writing about how soap opera fans built relationships with one another while transforming television viewing into a collaborative endeavor. Her book Tune In, Log On: Soaps, Fandom and Online Community (Sage, 2000) synthesizes that work. Her recent publications include "The New Shape of Online Community: The Case of Swedish Independent Music Fandom" in First Monday, as well as articles in New Media & Society, The Handbook of New Media, and The Information Society. With Annette Markham, she is co-editor of Internet Inquiry: Conversation about Method (forthcoming from Sage), a book examining how exemplary qualitative researchers manage the challenges raised when studying the internet. She is currently studying the "friend" relationship in the music-oriented social network site Last.fm and writing a book, Personal Connections in a Digital Age, about digitally-mediated community, relationships and social networks for Polity Press. She was a co-founder of the Association of Internet Researchers and served as its President. She blogs at OnlineFandom.com.